Prescription painkillers are among the most common drug addictions. This is namely because they are prescribed often, and they’ve been known to help with a range of health conditions and chronic pain. They’re also prescribed after surgery and other medical procedures. Because they are so often prescribed, many users who become addicted do not set out to abuse the drugs or become addicted. They often take the prescriptions as directed, but still wind up with a dependency. Or, rather, their bodies require higher and higher amounts of the drug in order to produce the desired results. Additionally, those who are dependent on prescription pain medications will often experience withdrawal symptoms if the drug is discontinued. Can I be addicted to painkillers? Yes, you can become addicted to painkillers; they are often prescribed and usually easy to acquire. Those who use painkillers follow the dosage as prescribed, but still wind up dependent on the drug or higher dosage consumption to achieve the desired effect. Most painkillers are depressants, which means they depress function of the central nervous system. Some of the most common painkillers are in the opioid classification, meaning they bind to the opioid receptors of the brain to prevent pain. These are also some of the most addictive pain prescriptions given. Estimates are that 4.7 million Americans are addicted to painkillers in the US. Up to 7% of people who are prescribed an opiate or analgesic pain medication will become dependent. This doesn’t include those who abuse painkillers when taking them for nonmedical purposes. If you, or someone you know, experiences these symptoms while taking a prescription pain medication, immediate medical attention should be sought. 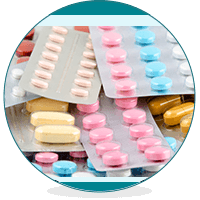 There are a wide range of prescription pain medications to which one may form an addiction. Some are more addictive than others, but all can be abused and all can cause a dependency if taken in excess or if taken for an extended period. Codeine – This is an opiate painkiller that is prescribed for mild to moderate pain and cough. It is milder than other opiates, but it can still be abused and it is often used as a gateway drug to more dangerous and addictive prescription drugs or illicit substances. Demerol – While Demerol is rarely prescribed now, especially outside of a hospital setting, due to its highly addictive nature, it is still abused by many. It is a narcotic and produces euphoria similar to other narcotic painkillers, such as morphine. Darvon – Darvon used to be widely circulated and resulted in thousands of deaths while they were commonly used. Although they are have been made illegal, they may remain circulating on the black market. Fentanyl – This drug is rarely used because it is stronger than most others, with up to 100 times the power of morphine. It is commonly used in cases of extreme pain where the patient is already tolerant to opioid medications. Dilaudid – Known as “hospital heroin” Dilaudid is prescribed for severe pain in rare cases. It can easily cause an overdose, and it often leads to respiratory distress. Methadone – This medication is most often given for severe pain, as well as for those who are addicted to other opiates, including heroin. This use doesn’t affect its own addictive properties, and it is commonly abused. Hydrocodone – The main ingredients in Vicodin, Hydrocodone is most commonly combined with Acetaminophen, but it is also given in its pure form. Used often by teens who mistakenly believe that it is safer than other opioid drugs, it is highly addictive and dangerous. Oxycodone – Although this is one of the most widely prescribed painkillers available, it is also one of the most addictive. It is sold under the brand names Percocet and OxyContin. Morphine – Morphine is widely prescribed in hospitals, and highly effective at treating chronic pain. It’s also highly addictive and can cause severe, or even life-threatening, side effects. Military Members and Veterans – Although military personnel have lower instances of illicit drug use, their numbers of prescription drug abuse are much higher than the general population. This is likely due to the military’s “zero tolerance” policy when it comes to illegal drugs, but that doesn’t make prescription medications any safer. Teens – Young adults and teenagers make up a disproportionate percentage of people who abuse prescription pain medications. While military members usually get their medicines through a prescription, teens often get theirs from friends and family members. They also often steal medications prescribed to these individuals. Chronic Pain Sufferers – Anyone who is prescribed a painkiller can become addicted, sometimes even while following doctor’s orders. 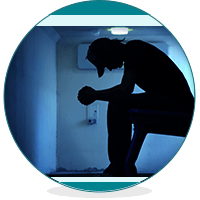 If any of these criteria describe you or someone you love, it may be time to look into an inpatient treatment facility to help you overcome your addiction to prescription painkillers. Although difficult to face, a painkiller addiction can be overcome with the right treatment. The best treatment plan usually involves an inpatient rehabilitation facility. Unlike outpatient counseling or support groups, an inpatient facility allows you to receive continual medical supervision during the detoxification period, ensuring negative effects and severe symptoms don’t prove dangerous while painkillers leave your system. A good rehab hospital will also provide you with the ongoing counseling, medical care, and support you need to ensure you stay on the right track once you go home. Your ongoing treatment plan my include prescription medications, counseling, doctor’s care, and peer support groups.